Have you ever tried to do a google search on a baby sleep schedule? When my kids were babies, I was always trying to get as much as information as possible on this. I spent so much time researching baby sleep because I was desperate for more sleep for myself. I knew there might not be an immediate solution, but I also wanted to get an idea when it might get better. My google searches turned up conflicting information and baby sleep schedules that didn’t match what my babies were doing. This led to unneeded stress regarding sleep for my kids. Now that I have gotten through the first year with 3 different children, I have rounded up answers to my biggest questions. 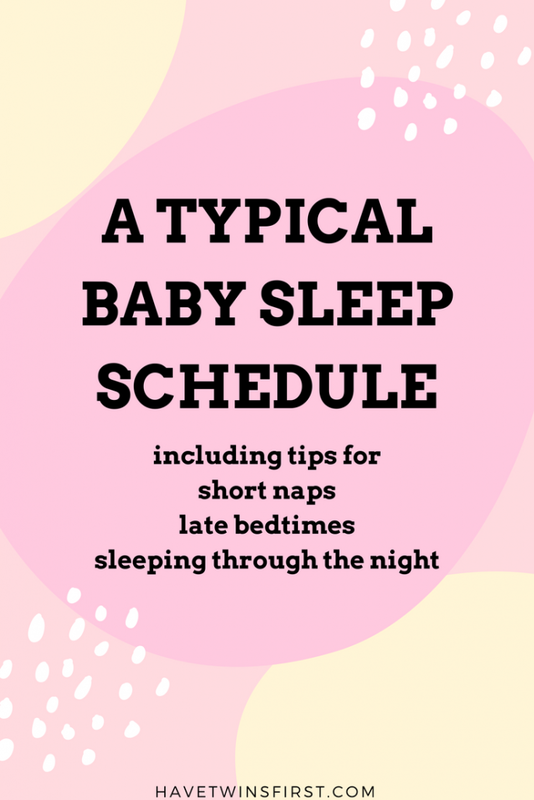 These topics include baby naps, sleeping through the night, baby bedtimes, and a sample baby sleep schedule chart. This is definitely something I struggled with in the 0-6 month time frame. My take is during the first 2-3 months of your baby’s life, naps are not always predictable. The most important thing is knowing how much time there should be between naps. At 3-6 months, my kids’ naps started getting shorter and this stressed me out. The internet was telling me their naps should be at least an hour long. Well, I’m here to tell you, if your baby is 6 months old or younger he does not need to take naps that are longer than 1 hour. If your baby is taking short naps, do not stress about it. There is a good chance it is out of your control. My kids were all short nappers at 3-6 months. I looked up all the tips and tricks to “fix” this problem. None of them worked and around 6 months old they just started taking longer naps. 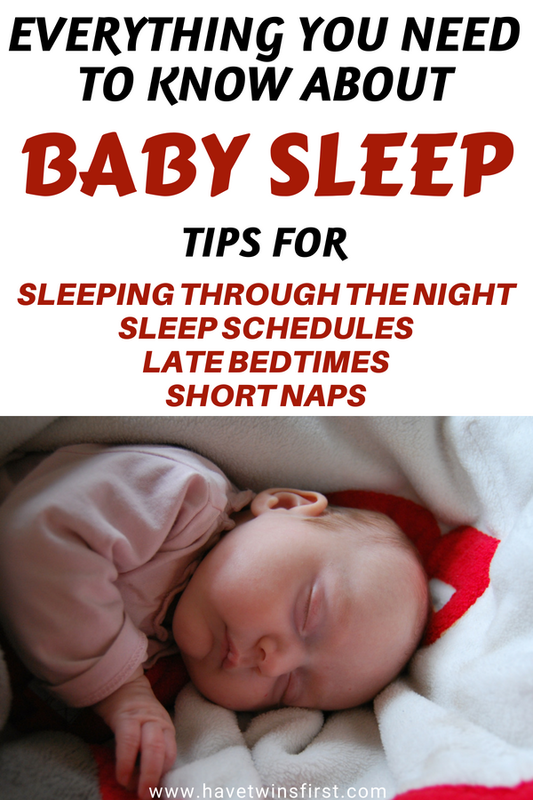 There are certain things that are important to do, to help your baby sleep. But, if you are doing them and your 0-6 month old baby is still taking short naps, do not worry. It will get better as they get older. For more details on baby sleep at 3-6 months click here. What does it mean when a baby sleeps through the night? I thought sleeping through the night would mean a good 7-8 hour stretch of sleep. That makes sense, doesn’t it? Well, as a new mom, I found out “sleeping through the night” for a baby, means 5-6 hours of uninterrupted sleep. The good news is the first time this stretch of sleep happens, you will feel well rested. However, after a week of this, you will start to wonder when your baby will start really sleeping through the night. A quick internet search gets you all sorts of varying answers; starting with my baby slept through the night since he came home from the hospital to my baby is 1 year old and has never slept through the night. I will say neither of these scenarios makes you feel better. My feeling is around 6-7 months your baby will probably have started sleeping through the night. However, it could take some sleep training on your end to get there. Definitely by 9 months, your baby should be capable of sleeping at least 8 hours (and probably even more) at night. Of course, there are always exceptions to this, but most babies will be capable of sleeping through the night in the 6-9 month range. There are things in your control starting at this age that will help you get there. Click here to check out our tips on helping your baby sleep through the night. Another thing I did not expect as a new parent were the late bedtimes. Two out of three of my kids would stay up late until around 11pm or midnight. The good thing was they did not wake up very early in the morning. However, I would worry as to why they were going to bed so late. If this is your case, I am again hear to tell you not to stress about it. Around 6 months of age bedtime will move up to a more normal time. As babies get older, their sleep becomes more regulated, and bedtime naturally moves up to a more reasonable time. Finally, I have assembled this baby sleep schedule chart on what I think is reasonable for different ages throughout the first year. The most important thing to focus on is the awake time. If your baby takes a 15 or 20 min nap he will likely still stay up the recommended time between naps. You will notice I have only listed time between naps and total sleep per day. If your baby is close to these two numbers then don’t worry! No matter what I’m sure you are doing a great job. If you are looking for more help on baby sleep, check out the rest of our sleep posts for both babies and toddlers. I hope my tips on naps, sleeping through the night, late bedtimes, and the baby sleep schedule help you and maybe even put your mind at ease as to what is normal. I’m always happy to answer questions, feel free to fill out our contact form with your baby sleep questions. I will personally send you a reply with any additional tips I can offer.